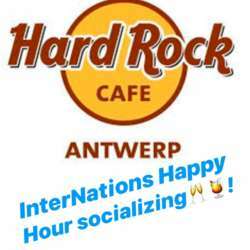 We are very happy to invite you to another evening at the Hard Rock Cafe. And this Wednesday mid-week event is special because Thursday it is a public holiday (Ascension Day) in Belgium! So if you want you can continue the party until very late in the city. This event guarantees you an iconic location, international atmosphere and great music. And...as a special treat all InterNations members will be able to enjoy an extended Happy Hour from 17h30 until 20h00! This is even better than 1 free drink, this is many free drinks depending on how thirsty you are!! Also we will have a free raffle for several super prizes! Please note that also you can have great food at the Hard Rock Café. So for those who attend after work we recommend the amazing food.